Rishworthians go into the second local derby of the Yorkshire One season keen to repeat last season’s success. They travel the short distance to West Vale to take on Heath, where last season they won on the second Saturday of the campaign 29 – 18. Both sides have had a mixed start, Heath winning three of their first five games, while Rishworthians have only managed two victories. 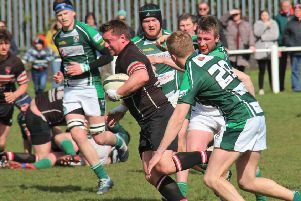 While Heath beat Pontefract in the Yorkshire Shield last week, Rishworthians had the week off as they are the county’s representatives in the Rugby Football Union’s Intermediate Cup. The Copley men expect to go into the game as underdogs and will be without skipper Fraser Swarfbrooke, who has a cracked rib, brothers Callum and Doug Heseltine and Josh Kelly, who came off in their last game two weeks ago with a badly gashed knee. They will have to deal with Heath’s strong pack, but were excellent in the forwards two weeks ago against Hullensians. Because of the club’s good contacts with Halifax Rugby League Club they have two new signings, Jack Fairbank and Chris Cullimore and hope to include them in their squad. Having secured their place in the last four of the Yorkshire Shield with last weekend’s win against Pontefract, Heath will be in confident mood. “It really was a much-improved performance against a side who we lost to in the league a couple of weeks ago,” said coach Dave Harrison. Making his starting debut was Michael Reynolds at scrum half as he replaced Peter Birkett who was drafted in at open-side flanker after Jordan Moana was a late withdrawal. “I was very impressed with both players throughout the game with Michael showing maturity for such a young player and Peter was outstanding in his new role,” said Harrison. “He took advantage of losing the shackles and showing me he is very versatile and has given me a selection headache for the derby. Also back in contention for a start are Jason Merrie and winger Callum Harriett-Brown who returns from holiday.